To create better batteries and fuel cells, scientists must make oxygen molecules gain and lose electrons efficiently. The reactions are frustratingly sluggish. Speeding the reactions requires heat and platinum, which are costly. Now, researchers uncovered vital design principles to engineer catalysts that use more readily available metals and less heat. The catalysts performed well and were stable over the long term. Scientists have been searching for better catalysts for electrodes in fuel cells and batteries. These catalysts drive reactions that move electrons to and from oxygen (known as oxygen electrocatalysis). However, creating such catalysts has been difficult. Why? Researchers used trial-and-error approaches. They needed the underlying design principles. With this information in hand, researchers can better avoid dead-ends and work on the most promising options. Creating efficient metal-air batteries, fuel cells, and other energy conversion and storage systems depends, in part, on how quickly oxygen molecules gain and lose electrons. To make these systems commercially viable, they need catalysts that are inexpensive, active, selective, and stable. Researchers have been examining promising catalysts made from various ratios of less expensive metals. Specifically, these catalysts are layered, mixed ionic-electronic conducting oxides. The researchers showed that a calculated descriptor, how tightly oxygen binds to a spot where an oxygen atoms is missing on the catalyst's surface, can identify the most promising structures. The team tested how well this descriptor predicted catalytic performance by synthesizing, characterizing, and testing catalysts with different descriptor values. 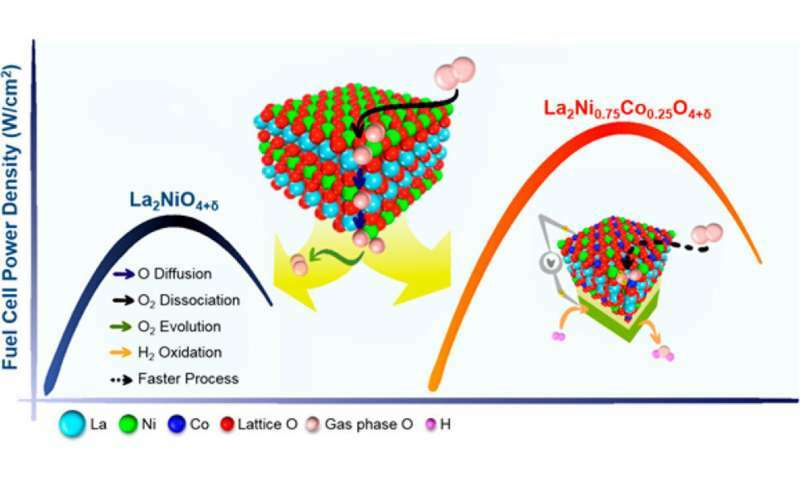 They found that nano-sized rods made from cobalt-doped lanthanum nickelate oxide worked well in solid oxide fuel cells at around 1000 degrees Fahrenheit and were stable over the long term. The team's results demonstrate the effectiveness of the design principles. Further, the work highlights the potential of the new catalyst and should benefit design efforts for fuel cells and batteries. Amazing how only the Americans are not on the metric system yet in this article the mention of temperature is in Fahrenheit! What a joke. Catch up America or are you on average too stupid to understand and make the switch? Must have been authored by an American.